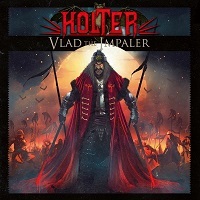 HOLTER proudly presents their 2018 album “Vlad the Impaler”. The album is an eleven-track, 49-minute of sonic beating featuring an old school power metal sound we always loved. The album artwork features the infamous Vlad the Impaler and his grisly, grisly hobby of impaling people. This image will give you a hint of what’s in the music. Yes, it’s bloody, fiery, and sometimes, darkly crazy. So, what’s really inside it music-wise? Well, as I already mentioned, it has a solid bedrock of old school power metal. Look back at HAMMERFALL and MANOWAR for easy reference. Also, the rhythms and orchestral layers have shadows of AVANTASIA in it. However, despite leaning heavily on a classic power metal sound, the album has certain modern touches in it, including the utilization of a second, female vocalist and the ruthless display of furious guitar shreds. Opening track “Worlds on Fire” effortlessly and strongly introduces the album and discusses everything that you might find in it. The melodic approach on the vocals, the high-and-low riffs and the ultra beatings of the drums makes it a perfect “metal fist in the air” power metal anthem. The guitar solos at the closing end of the song only blazed the cauldron even more with its lightning fast tempo and laser sharp precision. This was immediately followed-up by “Awakened” which was a strong reinforcement to the already strongly established opener. “Drums of Doom” then enters the arena and induces a tension buildup with its intro featuring uh, yeah, the drums of doom. When I said earlier that this album has some darkly crazy moments, this one is the archetype. Almost everything here is shifty – the tempo, the mood, and the vocal delivery. Diversity is what they show in the later half of the album, with songs like “Shadows of Love”, “Under My Skin”. The two mentioned songs are more “rocky” than the rest, and it also features female vocals. Despite that, they never lost the energy and adrenaline provided by the guitars and drums. The title track, “Vlad The Impaler” is the last thing that you would expect it to be. Yes, it’s an instrumental. An EPIC instrumental showcasing a combination of dark heavy riffs, a solid bass and thunderous drums layered all over an orchestral vibe provided by the keyboards. The album also includes the second part of their song “Save Me” and an acoustic rendition of “Shadows of Love”. It was an awesome album that traces almost the entire timeline of power metal. Definitely deserves a slot in your power metal collection!